Our service is backed with technical assistance to suit the ever changing demands of our customers. In house design,development,and manufacture of equipment to handle and dewind wire in the most effective way are all part of our service. All our spools of stitching wire are precision traversed wound to ensure tangle free dewinding. To optimise the dewinding process the wire has to be kept under constant tension. 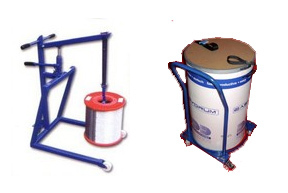 The dewind equipment provided by us will create this tension to suit all customers specific needs. Maintenance kits are also supplied to ensure this essential part of equipment is kept in good condition. This will aid in the performance of wire to create the perfect stitch. Below shows the dewind equipment in action on a MP100 spool of wire.